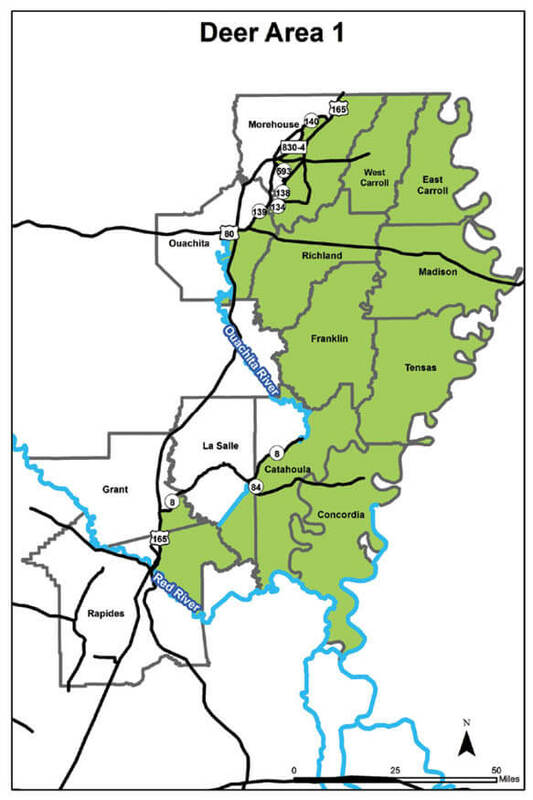 Catahoula East of Boeuf River to Ouachita River, east of Ouachita River from its confluence with Boeuf River to LA 8, south and east of LA 8 southwesterly to parish line. Grant East of US 165 and south of LA 8. LaSalle South of a line beginning where Little River enters Catahoula Lake, following the center of the lake eastward to Old River then to US 84, east of US 84 northward to LA 8, south of LA 8 eastward to parish line. Morehouse East of US 165 (from Arkansas state line) to Bonita, south and east of LA 140 to junction of LA 830-4 (Cooper Lake Road), east of LA 830-4 to Bastrop, east of LA 139 at Bastrop to junction of LA 593, east and north of LA 593 to Collinston, east of LA 138 to junction of LA 134 and south of LA 134 to Ouachita Line at Wham Brake. Ouachita South of US 80 and east of Ouachita River, east of LA 139 from Sicard to junction of LA 134, south of LA 134 to Morehouse Parish Line at Wham Brake. Rapides East of US 165 and north of Red River. Catahoula South of Deer Creek to Boeuf River, east of Boeuf and Ouachita rivers to LA 8 at Harrisonburg, west of LA 8 to LA 913, west of LA 913 and LA 15 to Deer Creek.